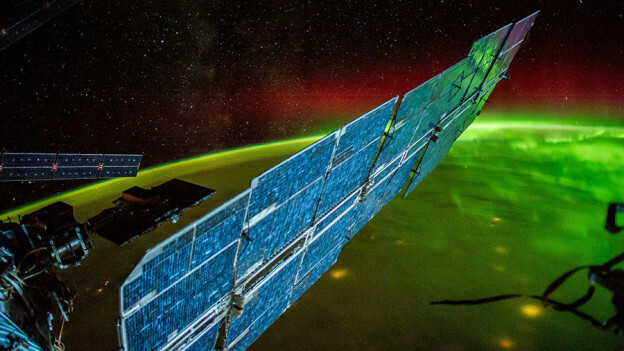 A solar array is seen in the foreground as the International Space Station flies over an aurora. Two astronauts are ready to finish a cooling system repair job that was started three years ago on the outside of the International Space Station. NASA astronauts Scott Kelly and Kjell Lindgren will exit the U.S. Quest airlock Friday at 7:10 a.m. EST for about six hours and 30 minutes of spacewalking tasks. Kelly and Lindgren are restoring the port truss cooling system back to its original configuration after leak repair work done in November 2012 by spacewalkers Suni Williams and Aki Hoshide. More leak repair work was done to the system during a May 2013 spacewalk by NASA astronauts Chris Cassidy and Tom Marshburn. Kelly and Lindgren will also top off the cooling system’s ammonia levels using storage tanks. The Photovoltaic Thermal Control System dissipates heat generated at the space station from radiators attached to the truss structure. 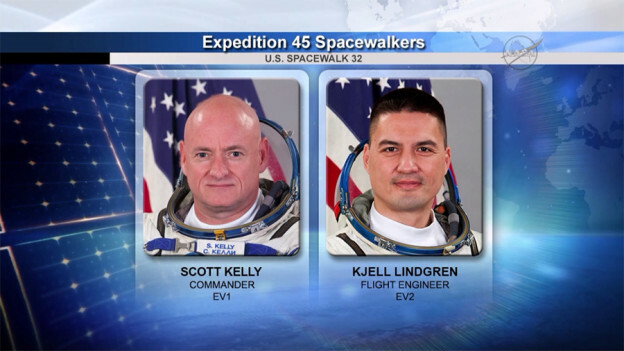 This will be the second spacewalk for both astronauts whose first was on Oct. 28. Japanese astronaut Kimiya Yui and veteran cosmonaut Sergey Volkov will assist the spacewalkers into their spacesuits and the airlock before depressurization begins. Yui and Volkov will also welcome the spacewalkers back into the station at the end of their excursion. NASA astronaut Scott Kelly snaps a quick space selfie during his first ever spacewalk on Oct 28, 2015. Two NASA astronauts are getting ready for their second spacewalk Friday morning while also conducting science. The rest of the global crew worked on orbital lab maintenance and continued international space research. Expedition 45 Commander Scott Kelly and Flight Engineer Kjell Lindgren organized their spacewalk tools today and attached checklists to their spacesuit cuffs. Japanese astronaut Kimiya Yui, who will coordinate Friday’s spacewalk from inside the International Space Station, assisted Kelly and Lindgren with their tool checks. The three astronauts also had time today for some science work to improve life on Earth and for future crews. Lindgren downloaded data captured from tiny free-flying satellites known as SPHERES that test autonomous rendezvous and docking maneuvers and other flight techniques. Yui worked on the Capillary Flow Experiment with results potentially benefiting fluid systems on future spacecraft. Finally, Kelly took a test to measure his cognitive adaptation during his year-long spaceflight. NASA astronaut Scott Kelly is photographed just outside the airlock during his first ever spacewalk on Oct 28, 2015. NASA astronauts Scott Kelly and Kjell Lindgren are looking ahead to Friday morning’s spacewalk to return the port truss cooling system back to its original configuration after repair work completed in 2012. Japanese astronaut Kimiya Yui will assist the spacewalkers before they get out the door and coordinate their activities from inside the International Space Station. Today, the trio reviewed the cooling system servicing spacewalk procedures and organized their tools. Kelly and Lindgren will work with ammonia fluid cables and tanks during the spacewalk scheduled for Friday at 7:10 a.m. EST. Yui joined the duo and trained for the possibility their spacesuits may come in contact with ammonia coolant flakes. Expedition 1, the first space station crew, poses inside the Zvezda service module with a model of the young International Space Station. Pictured in December 2000 (from left) are Commander William Shepherd and Flight Engineers Yuri Gidzenko and Sergei Krikalev. Today marks 15 years of continuous habitation aboard the International Space Station. Expedition 1, the first station crew, docked Nov. 2, 2000 after launching two days earlier inside the Soyuz TM-31 spacecraft. The young space station at the time consisted of just three modules including the Zarya module, the Zvezda service module and the Unity module. Commander William Shepherd and Flight Engineers Sergei Krikalev and Yuri Gidzenko spent 141 days in space, saw two space shuttle missions and the addition of a solar array truss structure and the U.S. Destiny laboratory module. The current six-member crew, Expedition 45, consists of NASA astronauts Scott Kelly and Kjell Lindgren, Japanese astronaut Kimiya Yui and veteran cosmonauts Sergey Volkov, Mikhail Kornienko and Oleg Kononenko. 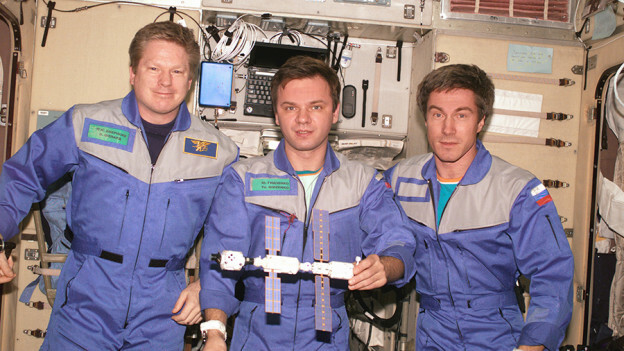 Kelly and Kornienko are spending nearly a year in space. The crew worked a wide variety of lab maintenance and advanced science exploring how life adapts to long-term space missions with potential benefits to Earth-bound humans and future astronauts. Today they researched new exercise techniques and how living in space affects a crew member’s attitude. The crew also explored how the station’s habitat affects the orbiting resident’s mental state and how lack of sleep and fatigue affects a crew member’s cognition. Another ongoing experiment that took place today researched the dynamic loads the space station experiences during spacecraft dockings, spacewalks and even crew exercise. 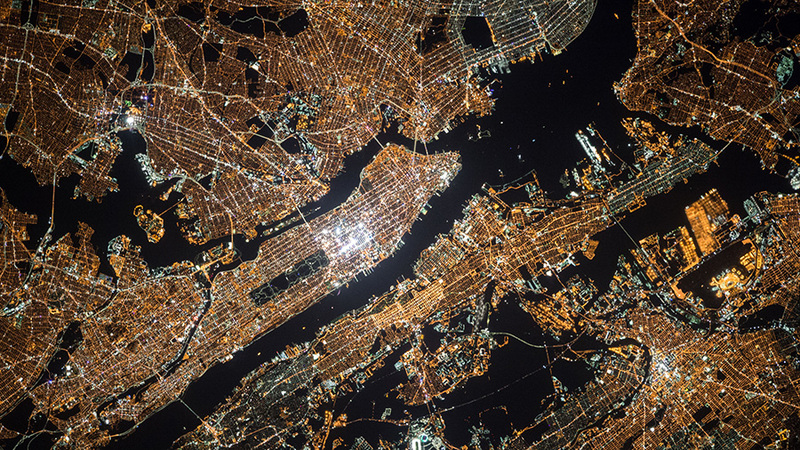 An Expedition 45 crew member captured this nighttime photograph of New York City. NASA astronauts Scott Kelly and Kjell Lindgren are now looking ahead to their second spacewalk scheduled for Friday Nov. 6 at 7:10 a.m. EST. 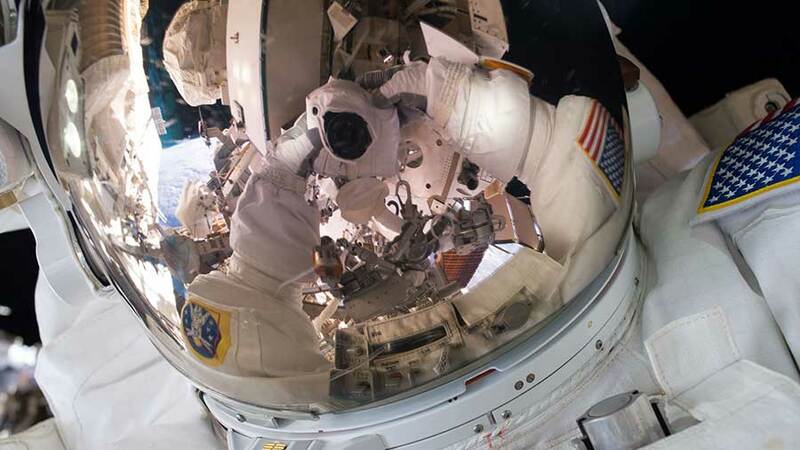 They will work outside for six-hours, 30-minutes to return a port truss cooling system to its original configuration after repair work during a previous spacewalk in 2012. Kelly and Lindgren are inspecting their tethers today which keep spacewalkers attached to the International Space Station. They are also reviewing procedures for the upcoming spacewalk and organizing their tools. Japanese astronaut Kimiya Yui, who is also the spacewalkers’ internal coordinator, worked in the Kibo lab module attaching science samples to an experiment platform. He then moved on to studying how plants grow in space without gravity to guide them. On the Russian side of the orbital laboratory, the cosmonauts explored tools and acoustic methods to detect micrometeoroid impacts on the station. The veteran trio of Sergey Volkov, Mikhail Kornienko and Oleg Kononenko, also researched the physics of plasma crystals and how a crew member adapts to piloting a spacecraft. 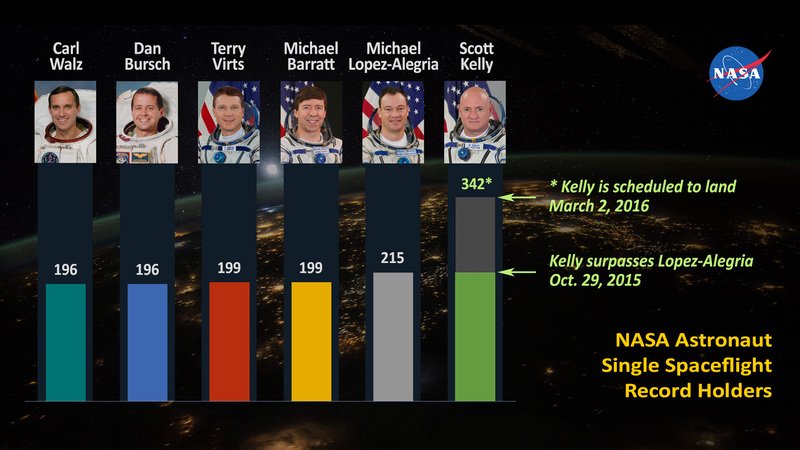 Expedition 45 Commander Scott Kelly has been in space longer than any other NASA astronaut. Today he exceeds Michael Lopez-Alegria’s record of 215 days on a single spaceflight. He passed Michael Fincke’s record of 382 cumulative days in space on Oct. 16. Kelly also completed his first spacewalk along with Flight Engineer Kjell Lindgren on Wednesday. The duo worked outside for seven hours and 16 minutes on a series of tasks to service and upgrade the International Space Station. They wrapped a dark matter detection experiment in a thermal blanket, lubricated the tip of the Canadarm2 robotic arm and then routed power and data cables for a future docking port. Meanwhile, the crew is back at work today on advanced space science and routine laboratory maintenance. Japanese astronaut Kimiya Yui explored how plants grow without gravity to guide them. Kelly recorded his impressions of the space station’s living and working space for the Habitability study. Lindgren trained for the VIABLE experiment that researches microbe development on station surfaces. The cosmonauts including Sergey Volkov, Mikhail Kornienko and Oleg Kononenko worked on scheduled tasks in the Russian segment of the orbital laboratory. They explored Earth photography techniques, the physics of plasma crystals and controlling a rover on the ground from space. 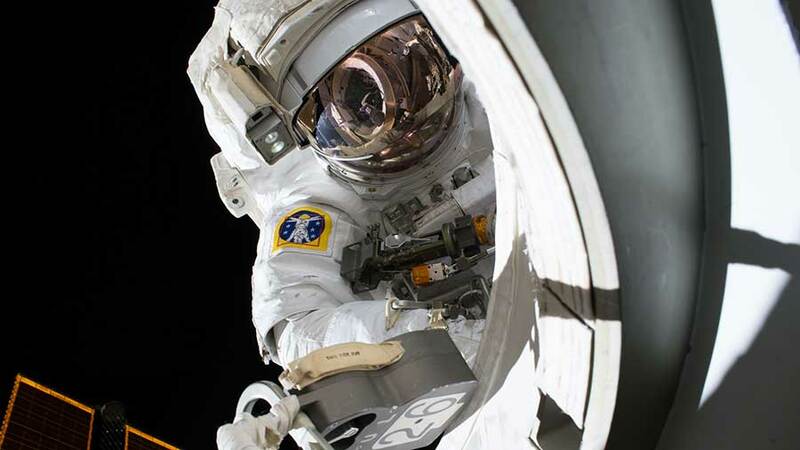 Approximately 2 hours and 30 minutes into today’s spacewalk, astronaut Kjell Lindgren successfully placed a thermal cover over the Alpha Magnetic Spectrometer (AMS) outside the International Space Station. First launched aboard the space shuttle Endeavour in May 2011, the AMS is collecting and analyzing billions of cosmic ray events and identifying dark matter. 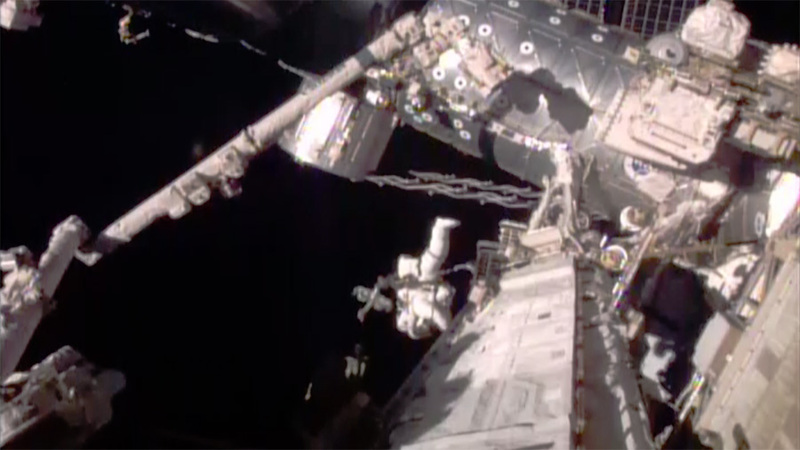 Scott Kelly has been removing some insulation from a power switching unit on the station’s truss to facilitate its future robotic replacement. Next up, Kelly will apply grease to several components of the 57.7 foot Canadarm2 robotic arm. Lindgren is working on routing power cables for the future installation of a docking port for commercial crew spacecraft. Follow @Space_Station and #spacewalk on Twitter to join the conversation online. NASA astronauts Scott Kelly and Kjell Lindgren switched their spacesuits to battery power at 8:03 a.m. EDT, signifying the start of today’s planned 6-hour, 30-minute spacewalk. NASA Television is broadcasting the spacewalk at www.nasa.gov/nasatv. 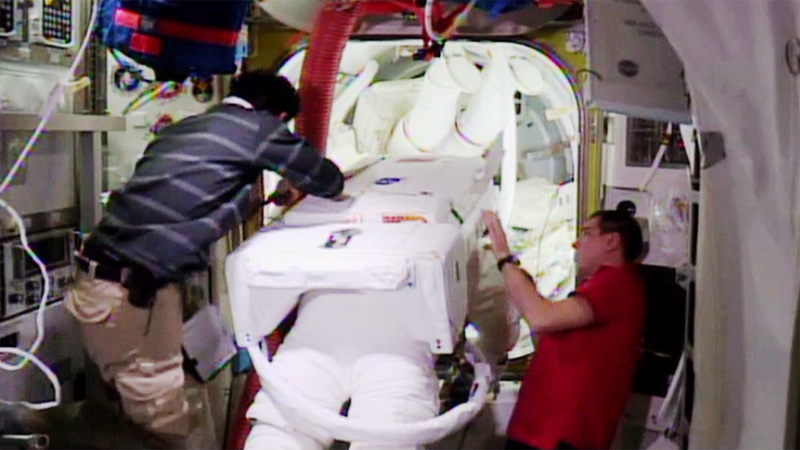 Kelly is wearing a spacesuit with red stripes and is designated EV1. His helmet camera displays the number 18. Lindgren’s spacesuit is white without stripes; he is designated EV2. His helmet camera displays the number 17. This is the first spacewalk for both astronauts. The first tasks for the astronauts will be to install a thermal cover over a dark matter detection experiment, the Alpha Magnetic Spectrometer, and to remove a piece of thermal insulation from a power switching unit to facilitate its robotic replacement in the future. NASA Television is providing live coverage of today’s U.S. spacewalk from the International Space Station. The spacewalk is scheduled to begin at 8:10 a.m. EDT, unless the crew is ready to begin earlier, and will last about 6 hours and 30 minutes. Watch the spacewalk live at www.nasa.gov/nasatv. Expedition 45 Commander Scott Kelly and Flight Engineer Kjell Lindgren will venture out of the space station to install a thermal cover on the Alpha Magnetic Spectrometer, which is a state-of-the-art particle physics detector that has been attached to the space station since 2011. In addition, they will apply grease to components on the space station’s robotic Canadarm2, and route cables to prepare for new docking ports for U.S. commercial crew spacecraft. This will be the first spacewalk for both Kelly and Lindgren and the 189th in support of space station assembly and maintenance. 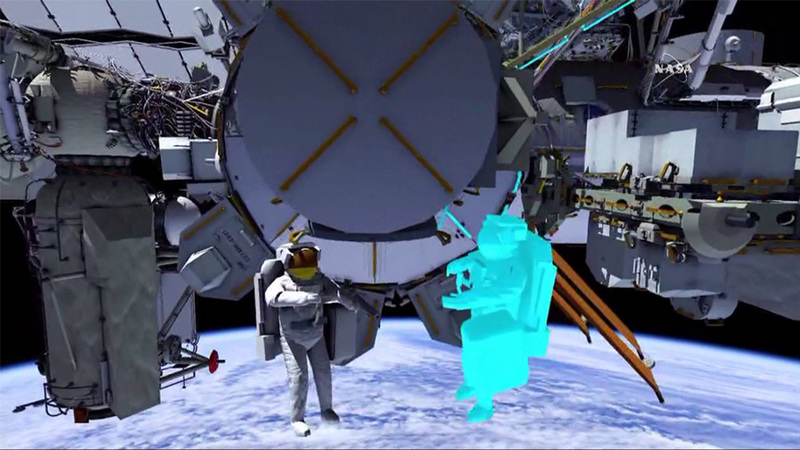 This is NASA’s 32nd spacewalk to service the space station. Nov. 2 will mark 15 years of humans continuously living aboard the International Space Station to advance scientific knowledge and demonstrate new technologies, making research breakthroughs not possible on Earth that also will enable long-duration human and robotic exploration into deep space.